We left the large sosta in Celle Ligure on the Sunday morning, along with many other Italian vans who had been weekending there. Before we departed Paul did his good deed for the day, we had noticed that the rather old van next to us had a plastic bag and elastic band in place of a fuel filler cap. We had finally managed to replace our temporary fuel cap with a proper one (well it says water on it, but it does the job), and so Paul gave the Italian driver our temporary universal fuel cap, we got a bag of bready snacks in return. The services at Celle Ligure were both awkward and busy (if you back into the service area you end up blocking the road), so we just took the toilet cassette to be emptied and left the water for another time. We always make a point of emptying the toilet when we can. If we run out of water it’s pretty easy to find a water fountain or even buy the stuff (we have only been reduced to this in the UK), but if we cant empty the toilet it becomes an emergency. From here we drove a pretty long way (for us) to Hône. 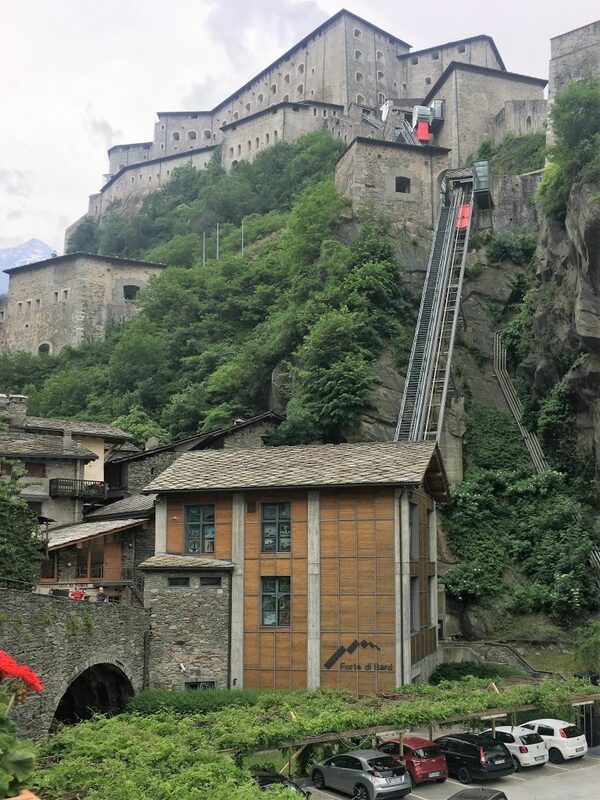 This was our entry point to the Alps, officially taking us into the Aosta Valley where we were planning to spend a couple of weeks. At Hône there is a small and neat paid sosta next to the river. Our sat nav tried to take us through the village, but a quick reverse back across the bridge and we were back on the main road that swings under the A5. It delivered us to another bridge just down the road from the sosta. It’s a pain in the backside having to second guess the sat nav but thank goodness for our phones. It was a sosta with yet another awkward emptying area – this time there were water taps between the pitches, so taking on water was fine, but grey water and toilet waste had to be dumped in a manhole just down the road. 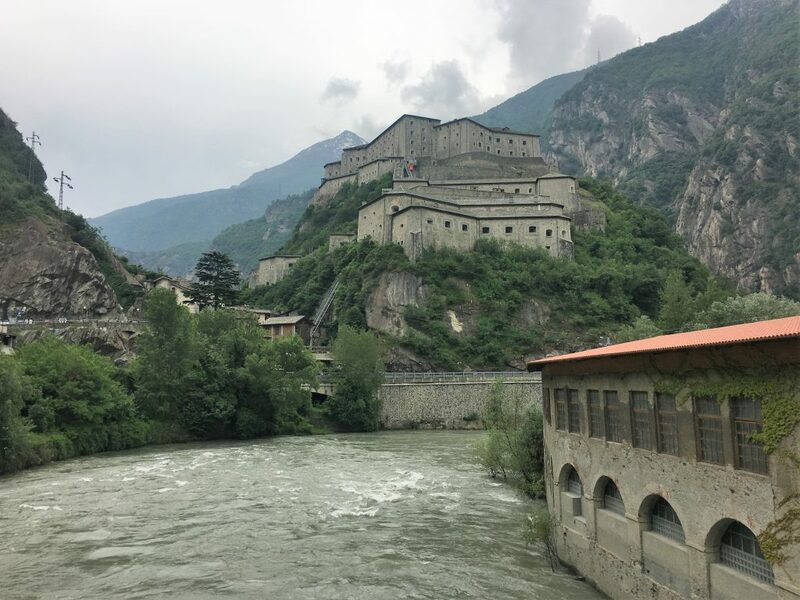 As we approached Hône we could see the bulk of Bard fortress above us, this 19th century fort was built on a defensive position that had been previously occupied by a medieval castle. It’s an impressive sight with ramps leading up to the three levels of the fort. At it’s base is the tiny medieval village, barely more than a street and pretty enough although we’ve seen so many medieval villages now it wouldn’t rank in the top ten. We looked at the website for the fort and found that general access to the restored fort is free, this includes use of the glass elevators that take people up the various levels. Once in the fort there are a number of exhibitions and museums that have to be paid for, but just a ride in the lifts sounded like fun. We were tempted to leave it to the next day, but the fort is closed on Mondays so we heaved ourselves out of Bertie and followed the path to the fort – it’s only ten minutes or so to get to the entrance where we stood in a small queue waiting for the first elevator to arrive. We were crammed into this one, but there were no queues for the subsequent two elevators which allowed us to enjoy the views of the mountains without the back of other people’s heads. When we got to the top we decided that the Museum of the Alps might be worth seeing. There are ticket sales points on each level of the fort so we found the one nearest the entrance to the museum and entered a world of complete sensory overload. The museum was really interesting, and after visiting we agreed that it had been worth the money, but the first part of the exhibition is a series of video and sound installations in darkly lit rooms that are pretty surreal. I would recommend spending a few minutes reading the first couple of pages of the leaflet that is handed out before going into the museum as it helps to set the context for the sounds and images and it is too dark in the rooms to read it as you go. Once out of this zone the museum became more standard. It had exhibits covering all sorts of aspects of the alps. Traditions, geography, nature, mountaineering, food, transport. We enjoyed the video of mounatineers using traditional clothes and methods to cross glacial terrain (rather them than me). There was a good display of images and videos showing the folk traditions of spring, including some quite disconcerting masks. And of course there was a mock up of a ‘Dahu’ the mythical animal which has two legs longer than the others to facilitate walking around mountains (it took me a few minutes to even work out what was so odd about it). When we got out of the museum we spent a little while wandering around the fort before descending via the road. On the way back to the sosta we found a café where we could pay for our night’s stay and get our ticket. We returned to the sosta to find another British van, they had just come through the Mont Blanc tunnel and were due to leave straight away the following morning on their way to the lakes. 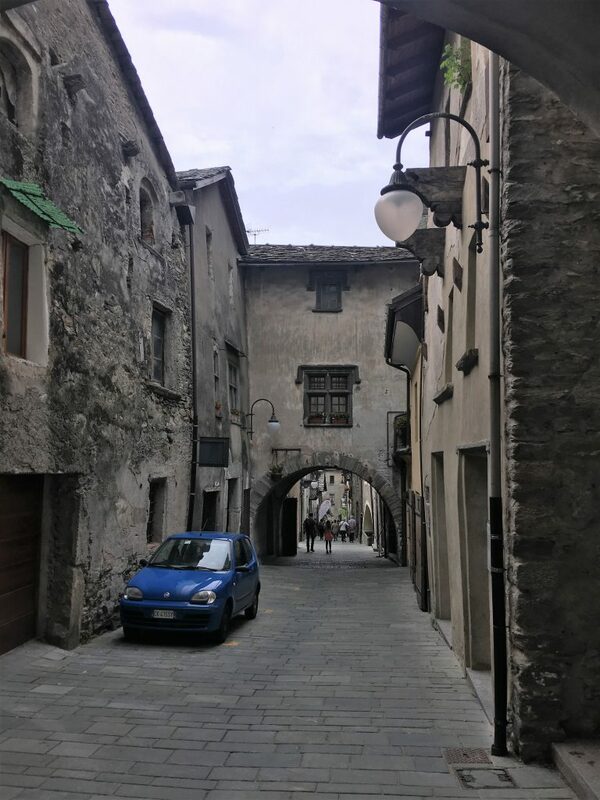 It seems a shame to miss out the Aosta valley, but everyone has different priorities, we haven’t been to the lakes, but were looking forward to spending more time here. That night there was a massive thunderstorm and we opened our bedroom blinds to watch the flashes of lightning. What a fantastic display. We could see that the other van had opened their curtains too, it was almost impossible to sleep through…not completely impossible though as I dropped off after half an hour.